Though the Eskimo differ from the Indians in so many ways, it is probable that both are descended from the Mongolian stock of Asia. 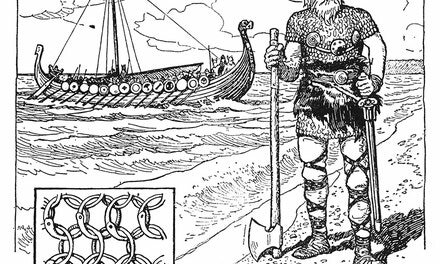 Some of the ruins of their prehistoric dwellings and camping places show traces of their contact with the Norsemen. The region they inhabited was the coast country from Labrador to Alaska, bordering the northern seas which abounded in the aquatic mammals, seals, walrus, and polar bears, on which they depended for food, heat, and clothing. 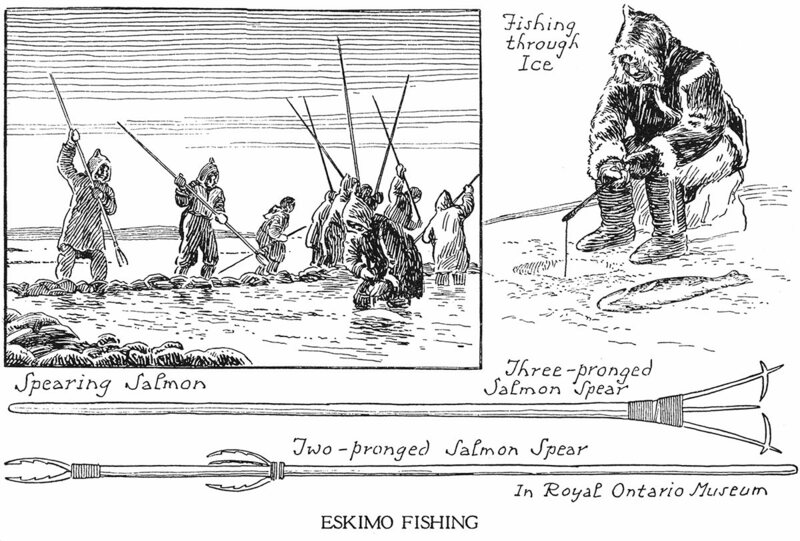 The rigorous conditions of their surroundings developed in the Eskimo a remarkable ingenuity in making use of the scanty materials available to them. The igloo or snow-hut is an example of their skill. Built of blocks of snow cut out and skilfully put together in a dome shape, it afforded an efficient and quickly constructed shelter. In the absence of sufficient wood for fuel they used oil made from blubber, which they burned in a lamp carved out of soapstone, as were also their cooking vessels. The blubber lamp or stove was an original Eskimo invention, which gave a continuous and steady supply of heat for cooking and warmth, and a sufficient amount of light during the long winter. Their clothing was equally adapted to the climate; it was generally made of caribou fur, in two thicknesses in winter, with the fur of the inner garment against the skin. Shoes and boots were made of seal skin, which was also used for waterproof outer shirts worn in misty and rainy weather. The long tail of their coat was useful when they had to sit for long hours on ice or snow. For travelling they devised the kayak and the dogsled. The kayak was constructed by stretching the skin of the seal over a boat frame, including the top, leaving only a hole for the occupant who propelled the craft with a double-bladed paddle. The kayak was made water-tight by closely fastening the wide skirts of the paddler's oiled skin jacket around the manhole. 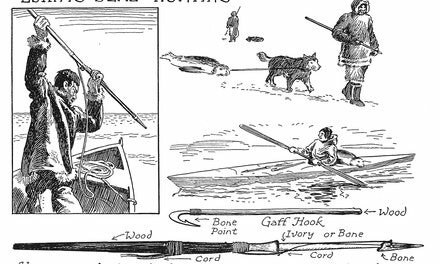 It was as light and as portable as the Indian birch-bark canoe, and if the vessel overturned it could be righted by a strong sweep of the paddle. Their heavily-laden sleds were hauled by teams of half-savage dogs, trained to obey the whip and word of command. In the development and use of the dog they far exceeded the Indians. The women were expert in the use of the needle, and the Eskimo were the only American aborigines to invent the thimble. They were skillful workers in bone, antler, ivory, flint and quartz, manufacturing all sorts of useful articles from these materials. Frequently these various objects were decorated with incised, engraved or carved designs.